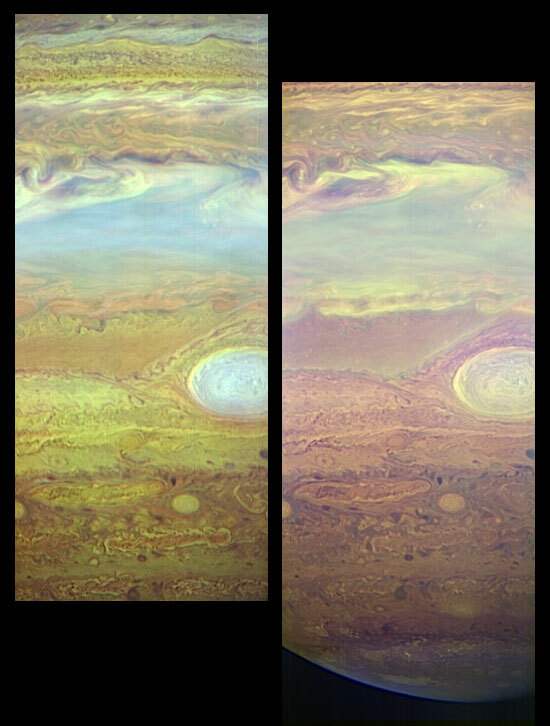 These images, taken with the LEISA infrared camera on the New Horizons Ralph instrument, show fine details in Jupiter's turbulent atmosphere using light that can only be seen using infrared sensors. These are "false color" pictures made by assigning infrared wavelengths to the colors red, green and blue. LEISA (Linear Etalon Imaging Spectral Array) takes images across 250 IR wavelengths in the range from 1.25 to 2.5 microns, allowing scientists to obtain an infrared spectrum at every location on Jupiter. A micron is one millionth of a meter. These pictures were taken at 05:58 UT on February 27, 2007, from a distance of 2.9 million kilometers (1.6 million miles). They are centered at 8 degrees south, 32 degrees east in Jupiter "System III" coordinates. The large oval-shaped feature is the well-known Great Red Spot. The resolution of each pixel in these images is about 175 kilometers (110 miles); Jupiter's diameter is approximately 145,000 kilometers (97,000 miles). The image on the left is an altitude map made by assigning the color red to 1.60 microns, green to 1.89 microns and blue to 2.04 microns. Because Jupiter's atmosphere absorbs light strongly at 2.04 microns, only clouds at very high altitude will reflect light at this wavelength. Light at 1.89 microns can go deeper in the atmosphere and light at 1.6 microns can go deeper still. In this map, bluish colors indicate high clouds and reddish colors indicate lower clouds. This picture shows, for example, that the Great Red Spot extends far up into the atmosphere. In the image at right, red equals 1.28 microns, green equals 1.30 microns and blue equals 1.36 microns, a range of wavelengths that similarly probes different altitudes in the atmosphere. This choice of wavelengths highlights Jupiter's high-altitude south polar hood of haze. The edge of Jupiter's disk at the bottom of the panel appears slightly non-circular because the left-hand portion is the true edge of the disk, while the right portion is defined by the day/night boundary (known as the terminator). These two images illustrate only a small fraction of the information contained in a single LEISA scan, highlighting just one aspect of the power of infrared spectra for atmospheric studies.